Some foods are said to bring us good luck, health or prosperity if eaten on New Year’s Day — black-eyed peas, whole fish, pork, pomegranates, greens, cake and more depending on your traditions and cultures. On holidays in Alaska, we also like to bring a taste of home to festive, celebratory meals with local seafood, berries or preserves and other special ingredients. For some, king crab is a must because the delicious seafood is in season just in time for the winter holidays! Whether you plan on visiting Alaska this year or are reminiscing over memories of a past trip, it’s easy to bring a taste of the Last Frontier to your New Year’s table. Let the flavors transport you to Alaska’s wild landscapes where you can pull wild salmon from the waters and pick fresh berries during a hike. Begin your meal with greens, like this kale salad with goat cheese, orange and pomegranates, shared by Alaska from Scratch. The greens and pomegranate combination might just be extra lucky, and a healthy way to kick off the new year! Turn to Alaska Seafood Marketing Institute’s endless seafood recipes on wildalaskaseafood.com to serve up a beautiful whole fish or find a crab recipe that makes your mouth water. Just remember to look for Alaska seafood at your grocery store. 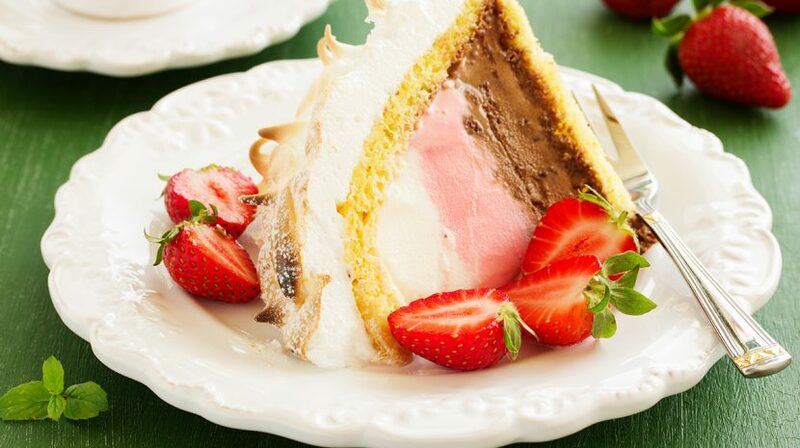 Baked Alaska is a classic dessert, and a beautiful round cake to complete your lucky table! This is an easy holiday recipe that might become a tradition in your house. This meal will have Alaska on your mind all day and bring you a generous helping of good luck in the new year.